The Czech Republic is, as ever, distinctly short of things for children to do in the summer. So the only real option when the weather’s hot – and bar a few thunderstorms it has been continually sunny – is to head for the local open air swimming pool: health and safety and the big leisure department of big councils have pretty much eliminated the local lido as phenomenon in England. You can find them, of course, especially in nooks and crannies of London boroughs, but they are curiosities hidden away or forgotten about or turned into urban lakes where swimming is definitely not on the agenda. Not so the Czech Republic. Despite tougher hygiene regulations pretty much every municipality has its koupaliště or plovarna and they are still a firm fixture of any Czech summer. Indeed, so much Civic Democrat leader Miroslav Topolánek, is kicking off his campaign to get acquainted with the voters of South Moravia – where he will head his party’s list – with a tour of local koupáky just to convince all and sundry that he is a normal down-to-earth Czech bloke on his second marriage and not a corrupt, sleazy politician who hangs out with lobbyists for big electricity companies and spin doctors on expensive yachts in Italy awhen not walking around in the buff on Silvio Berlusconi’s poolside. Perish the thought. It’s a clever strategy. Unlike Klaus – who can wow and work a crowd and charm opponents, but whose efforts to join the victorious Czech football team and be one of the lads was one of the more excruciating things I remember seeing on Czech TV – the Ordinary Bloke role is one Topolánek can do very well. Equally, cleverly there’s no need to do much politics: no party programme (as yet) to defend and no big billboard campaign to annoy people and remind them they’ll have to go and: just the occasional swim or game of volleyball in lidos and sports grounds across various factory towns interspered with a bit of well publicized cycling between locations (taking the limo for the hilly bits, you understand). And, of course, Topol’s change of scene also leaves Karel Schwarzenberg – staring down lugubriously down from posters everywhere like some kind of aristocratic Big Brother – and the very boouent TOP09 party a free run in Prague, where they are likely to do well and, where, conincidentally Topolánek’s main party rivals are based. Our own tour of Moravia also takes in every koupák and swimming lake (otevřené koupalište) for miles around- we even drive across the border into Slovakia and sample Trenčin’s large and clean municipal kupalisko sandwiched between fooball stadium, castle and main railway line – although less political reasons than to ensure the kids have something to do. We end, as we began, with the municipal lido in Starý Liskovec , the village on the outskirts of Brno long, which has since swallowed up by the high rise housing estate of Nový Liskovec built in the mid-70s. And, on balance, it is probably actually the best one. Not as clean Trenčin. Slightly less to do for kids, than some of the lidos renovated by ambitious mayors in increasingly sleek and prosperous looking villages around Uherský Brod. And certainly rather less genteel than in spa town of Luhačovic. It’s no high rise ghetto, but most people who could afford to do so have long since moved out of the estate and the pool attracts poorly off people who don’t have the money, time or paid holiday to go elsewhere. Much to my mother-in-law’s disapproval, there are chuge louds of cigarette smoke rising up in the air from the poolside area, as if there was some small factory there. 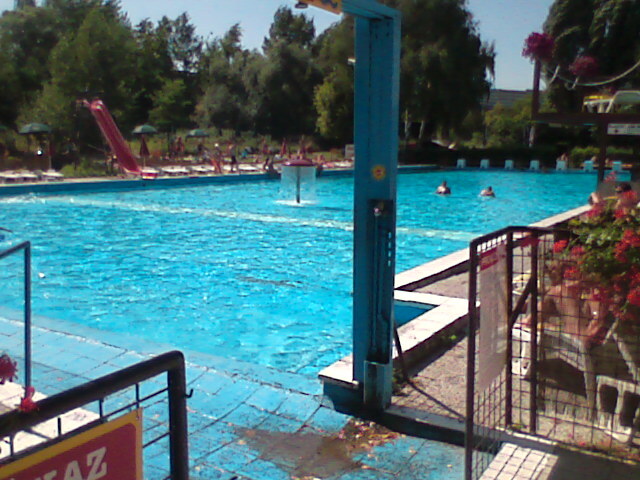 Still, it’s shady; there’s enough space to swim in the main pool; the children’s pool has enough squirtly fountains to please the kids and they do do excellent hotdogs. I keep my eyes peeled, half watching the kids, half wondering if Topolánek will turn up. Perhaps he has already turned up, incognitio? There is a bloke who looks a bit like him sitting on the lilo on the other side of the pool. But then again, he is reading the crime page of left-wing daily Právo, where would probably be a step too far even for this new style of low-key, politics-free summer election non-campaign. The Czech election campaign is indeed already in full swing – at least if you are a Social Democrat. 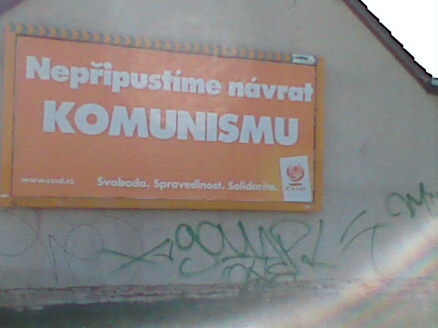 Not only are party workers – or, possibly paid employees, you never know these days – giving out orange roses at the local supermarket, but ČSSD is already forking out on a national billboard campaign. Most of it is predicatble stuff: caring nurse leaning over old people with a smile and promises of free health care; Mr and Mrs Average and their two kids and some slogan about looking their ‘social certainties’ paying out of the profits of the electricity oligopoly ČEZ etc etc. And, of course, that makes perfect sense if you want a country brimming with enough ‘social certainties’ to ensure that everyone has enough money to keep the wheels of capitalism turning down at the local Interspar. I’m not sure, however, if this billboard wasn’t perhaps something of own goal in reminding everyone of this rather obvious home truth of Czech politics. Last night I killed an intruder. He had been lurking behind the lace curtain by the open glass doors to the balcony. When he came into the room around 1am, I was ready for him. 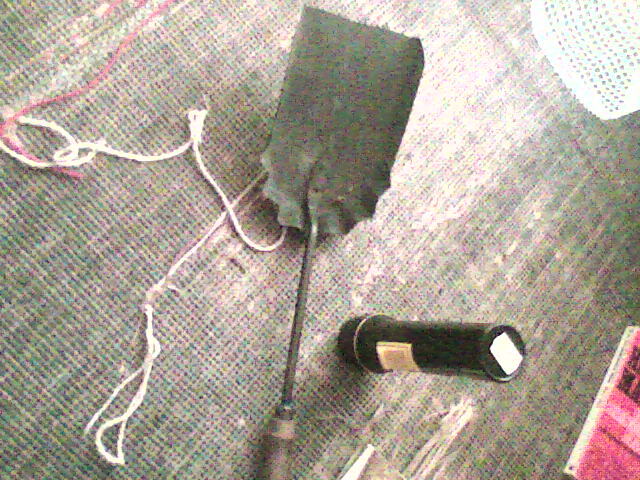 Shone a torch in his face and, before he could react, struck him with a metal shovel I had got from the grate in case he showed up again. He dropped to floor with a surprising heavy thud. Emboldened, I went downstairs to deal with his mate, who I knew was waiting down there in the dark. Damn pesky blighters hornets… But the kids are terrified of them. My wife’s grandmother died at the age of 96 in January. She is to be laid to rest in a short ceremony in her home village near Zlín. Relatives from various branches of my wife’s family gradually assemble in the muncipal cemetry. It is sunny and the atmosphere is sombre but low key. Introductions are made, there some conversation and then the priest arrives. He says what his has to say in a straightfoward and dignifed way. There are short speeches by relatives. Flowers are laid, candles are lit. The priest departs and mourners drift off in small groups toward the local pub-restaurant where my mother-in-law has arranged a meal. The children, who have behaved well throughout, want to walk around the the graveyard, so I agree. 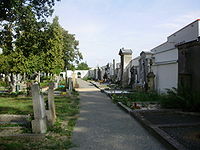 It is a municipal cemetry, not very near the church and there are relatively few crosses. One grave belongs to 32 year old who died in December 1914. A small photo set into the grave stone shows a man with a moustache in high collared uniform. Presumably he was killed in the early fighting on Serbian or Galician front which annihilated much of the pre-war Austro-Hungarian military at the start of the Great War. His wife, who died in 1930, and daughter who lived in 1980s are buried with him. There are some recent looking flowers on the grave. We get to the restaurant. Very oddly, when we get there it is pulsating with very loud, live Gypsy music. Two policeman from the Municipal Police walk out. I assume we’ve probably got the wrong place, but we walk in anyway to find out what’s going on, despite disgruntled local drinkers outside that the place is full of Gypsies. We are in the right place – and it is full of Gypsies. The pub, has somehow booked meal arranged by my mother-in-law to following the laying to rest alongside a Roma christening celebration There is an interesting kind of symmetry and the music supplied by 2-3 musicams with keyboard and synthaszier is foot-tappingly good, but the noise and ingruousness of it are too much for most of our party, who walk off – despite the landlord’s protestations – to see what can be arranged at the village’s other hostelry. Unsurprisingly, nothing can done for a party of twenty, so discontented mourners drift back, grumbling that the Roma – while not all of them are bad – have no consideration and shouldn’t even be there because they are not local. Luckily, the landlord has indeed now rescued the situation and agreed with the Roma , there will be no music for an hour and a half while we have our meal. The musicians stop. While my wife talks to elderly great aunts and cousins, I have nothing much to do except keep an eye on the kids and my attention increasingly wanders to the Roma party, who are sitting around a large table in covered courtyard just by the pub’s main function room where we are. They seems to have provided their own food: huge quantities of fried or possibly breadcrumbed meat. The women have sequined dresses and one is wearing a satin dress that ressembles a sari, many of the children are dressed in a kind of Sunday best, white-shirts or ribboned party dresses. Most of the men seem to be sitting next door in the bar. There is a lot of raucous sounding conversation, much coming and going, and huges amount of smoking. It is a world away from the more restrained Czech way of doing things : like some kind of Greek or Middle East event catapulted into Central Europe. Just after 12.00 as we are beginning to leave, the Gypsy music re-starts in earnest. A very large Roma man with moustache pork pie hat and fantastic voice fills the pub with a reverberating and haunting song.this time guests at the christening head into the pub to dance. “Where did you learn to dance so well?” my wife asks a Roma girl of 7-8 in white frock. “From my grandma” she replies. My wife’s grandmother would almost certainly not have approved of all this, but both events seem to have gone well.